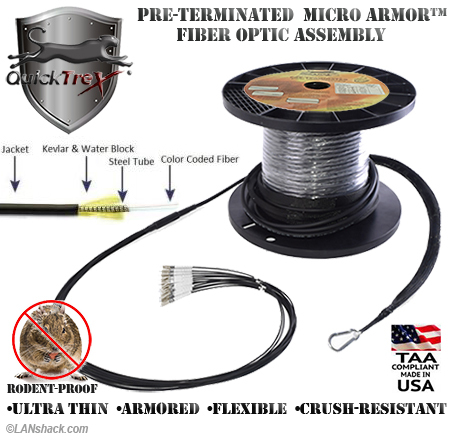 QuickTreX® brand, custom "Fiber whips™" Pre-Terminated Fiber Optic Assemblies have a longstanding reputation for quality and reliability. When we receive your custom order, we build the assembly to your specifications using the finest materials to our exacting standards. The assembly is made in the USA by skilled technicians under controlled conditions and comes to you fully tested and ready for immediate installation. 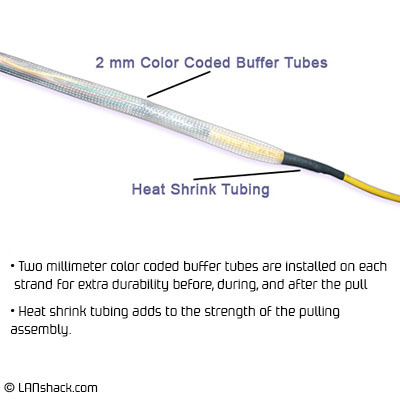 Our Ultra-Thin Armored Pre-Terminated Fiber Optic Assemblies utilize Micro Armor Fiber™. It's a revolutionary designed fiber optic cable that provides a perfect solution for your fiber optic installs and usage. Instead of a traditional interlocking armor it utilizes a steel spiraling technology. 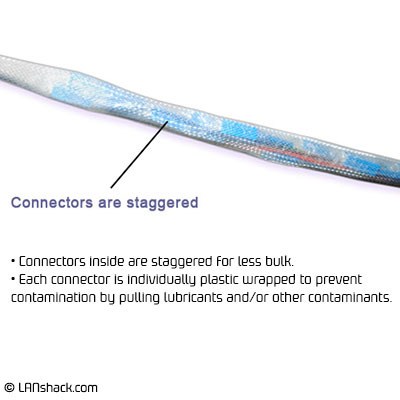 This allows for the cable to remain extremely flexible while also being crush and rodent resistant. 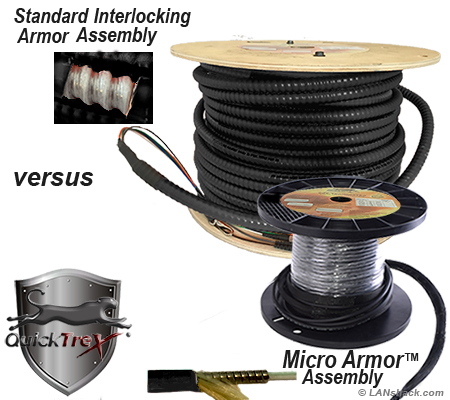 Micro Armor Fiber™ features the smallest outer diameter of any armor compared to conventional fiber optic cable in size and flexibility. Its light weight and great flexibility makes pulling and installs faster and easier. These assemblies are typically up to 65 percent smaller in diameter and 75 percent lighter than the usual aluminum interlocking armor cable. These assemblies provide a perfect combination of strong armor and maximum bend radius. They are available in indoor and outdoor options. They come available in OM1, OM2, OM3, OM4 and Singlemode and we can provide any standard fiber optic connector type such as LC, ST, and SC. All of our Indoor/Outdoor Micor Armor Fiber™ is plenum rated and is perfect for applications which involve transitions from outdoor to indoor plenum spaces. This elimates the need to transition from non plenum cable to plenum cable while also maintaining crush resistance and rodent resistance through your fiber optic installation. • Made to exacting specifications. • Factory terminated and tested. • Assemblies use all Corning cable and components. assembly to be pulled into place while protecting the connectors. 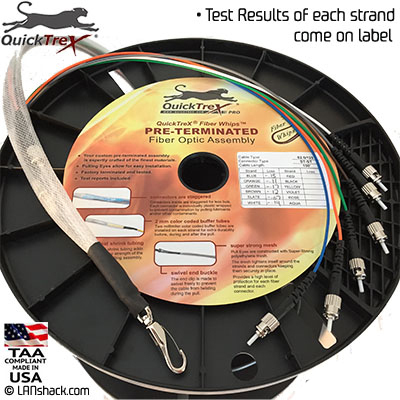 Choose QuickTreX® brand, custom "Fiber whips™" for all of your Fiber Optic Cable installations because they are among the finest and most reliable that you can get anywhere. Best Suited for: Indoor/Outdoor cables are approved for use in underground conduits, even if the possibility of water infiltration exists due to it's water blocking aramid strenght members & water block tape. It can also be used for standard Outdoor applications since it is UV resistant, but it is not rated for direct burial. 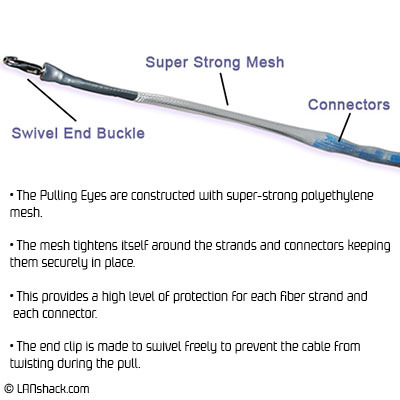 The advantage of using Indoor/Outdoor over standard Outdoor cable is that it does not have the 50 foot restriction for indoor installation that standard outdoor cable has. 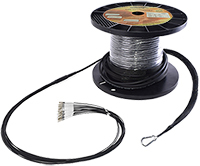 This cable also has an overall plenum jacket and is rated for plenum spaces. It has a extra durable jacket that adds extra protection during installation and in rugged applications.